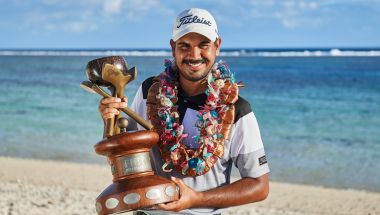 The final round of the 2018 Fiji International presented by Fiji Airways was a show worthy of the stage, Gaganjeet Bhullar edging out a white-hot Anthony Quayle to win at Natadola Bay Championship Golf Course. Gaganjeet Bhullar triumphed in Fiji. Indian Bhullar’s 14-under total proved to be one shot better than Queenslander Quayle, the 23-year-old’s astonishing nine-under 63 enough for a new course record but not the Sunday silverware. The par-five 17th has been Natadola Bay Championship Golf Course’s most vulnerable hole this week and it was the scene of the best entertainment late in the day, Quayle and Bhullar draining back-to-back eagles to set up a thrilling final round finish. Quayle snatched the lead at 13-under par – capping off a stretch of nine gained strokes in 13 holes – with a brilliant three at the par-five. With Bhullar, Quayle, Kiwi Ben Campbell (66), Jarryd Felton (69) and a threatening Els (65) all within two shots of the lead, the Indian saved par from the fringe to kick start his back nine, before holing another bomb on 11 to avoid dropping a shot. Four-time major champion Ernie Els didn’t waste any time in adding his name to the mix on Sunday morning, the South African holing out with a greenside chip for eagle on the par-five first, before backing that up with a birdie on three. Suddenly Els was at eight-under for the week and within one of the lead, but a wayward drive into the breeze at the fifth resulted in bogey and a crippling loss of momentum. Meanwhile, tournament host Singh saved his best until last, signing for a Sunday 68 to finish in the red numbers for the week.